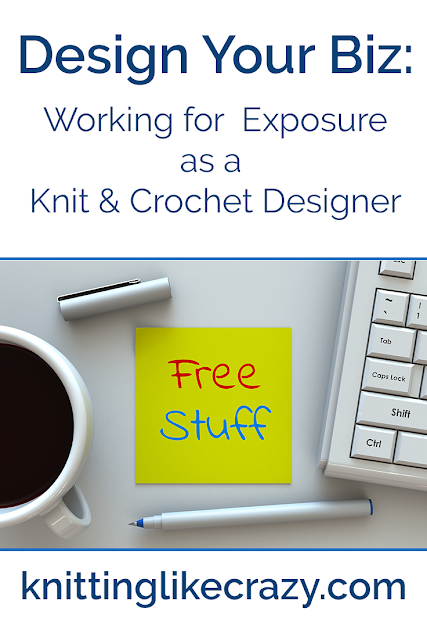 As a knit & crochet designer, I'm often to asked to work for free/very little money. ...is usually what the people asking that you to work for free/practically nothing will say. Today, let's talk about that. My answer almost always? Thanks, but no thanks. How is this work going to benefit your business? Is it really going to bring you income in other ways that's going to make it worth it? An example I see in our industry all the time - a company wanting to give away your pattern for free. Maybe they want you to do the work for free, or maybe they are trying to pay you a pitiful one-time fee for you to sign all the rights to your pattern away. Are you really going to get new customers off of that? In my experience and in the experience of many designers I know - no, you're not. While everyone enjoys a free pattern now and then, the majority of people downloading free patterns only want free patterns. You're going to convert only a teeny tiny amount of them into regular pattern-buying customers. So, is the exposure worth it? In my opinion, probably not. Does the person asking me to work for exposure respect me as a designer/artist/business? If they are asking you to work for free, then, no, they don't. Designers, unfortunately, are often viewed as a less-important segment of the yarn industry (which, honestly, is weird to me, because people need things to do with the yarn, needles, hooks, notions, etc. these companies sell). Don't feel like you have to say yes because they asked and you might like their product. In this business, you need to get good at politely saying no quickly or you will be taken advantage of. Ok, so this is getting a little sad. Not everyone in the industry is trying to take advantage of designers. Many companies do pay well and respect what designers do! You just have to find them. And, really, there are times when working for exposure might be worth it. You don't always have to say no. I've agreed to work for free when it comes to writing a blog post on another blog about one of my books. Sure, writing a blog post takes time away from doing something else, but I'm reaching more people and telling them about my book. I'm reaching new people I might not be able to reach otherwise, and hopefully some of that audience will be interested in my book and want to buy one. Ok, that's not entirely true. Like many new designers, when I first started out, I did do a few patterns for very little to no money. Looking back, maybe doing one pattern for very little money would have been fine. It is a good way to try to build your catalog a little bit. When you start out, you might have no audience or customer base, so you are getting your name out there. But, please, one pattern maximum. After that, make sure you're finding companies to work with that respect you and are willing to pay you what your worth! If you want more information about working for free or exposure, Tara Swiger just talked about this on her podcast recently. I found myself agreeing with what she had to say (as usual). As with many things in this Design Your Biz series, there's no one right answer. You really have to decide what's going to work for your business. But, I hope I've given you a few things to think about the next time you're asked to work for exposure.